A team of researchers from Massachusetts General Hospital, Florida State University, and University of Massachusetts has developed a new design of microchip that can retrieve microfluidically attached cancer cells for serial in vitro or in vivo analysis by via integrating a 3D hydrogel scaffold into a fluidic device. The researchers describe their approach in the forthcoming issue of the journal TECHNOLOGY. Circulating tumor cells are considered precursor metastatic cells that contribute to 90% of cancer-associated death. Microfluidic devices have enabled the capture of rare circulating tumor cells from patient blood samples. Clinical studies demonstrated an association between the number of circulating tumor cells and patient outcomes, a new metric which can transform the diagnosis and prognosis of cancers. In addition to measuring cell numbers, circulating tumor cells represent a unique window into understanding a patient’s tumor status and developing personalized therapies. Yet, microfluidic captured tumor cells are difficult to retrieve from devices without disrupting the cell’s physiological state for downstream functional characterization that requires ex vivo expansion or in vivo xenograft formation. Their paper describes a simple and effective strategy to integrate a 3D hydrogel substrate into a microfluidic device that can be retrieved after the capture of tumor cells. The team exploited an intrinsic property of hydrogels to undergo substantial and reversible volume change between hydrated and dehydrated states. A dry hydrogel scaffold was inserted into a capture chamber within a fluidic device and then rehydrated to fill the void volume of the capture chamber. 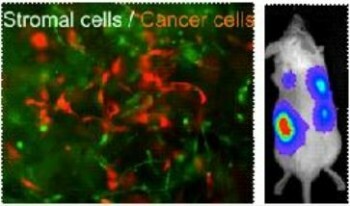 A cell suspension containing a prostate tumor cell line was used to verify that cancer cells would attach to the hydrogel matrix. The cell-scaffold scaffold substrate was easily retrieved from the device and cancer cells were shown to be viable for in vitro growth promotion assays. The tumor-scaffold was also implanted to immunodeficient mice and companion xenograft models were successfully made. “With improvements in specificity of capture and throughput of the microchip, we hope to test a next-generation device on patient samples and verify the clinical relevance of this approach,” says Prof. Jungwoo Lee, Ph.D. in the Chemical Engineering Department in the University of Massachusetts Amherst. “Companion models of circulating tumor cells can be a practical testbed to gain insight about new mutations and drug sensitivity of metastatic cells that can apply to patient care. This proof-of-concept study adds a new dimension to this important effort,” says Prof. Biju Parekkadan, Ph.D in Massachusetts General Hospital, Harvard Medical School and the principle investigator on the paper.